Topnir is equipped to analyze multiple heavy feeds in just a few minutes. With only one At-line or Laboratory apparatus, Topnir characterizes properties or ratio of components in agreement with the ASTM world-wide standard. 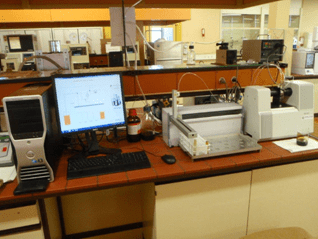 TOPNIR SYSTEMS has developed the TOPNIR SPEED (Sampling PErformance Excellence Design) SYSTEM which is an automat coupled to a spectrometer to determine spectra of heavy feed through a dilution procedure. The TOPNIR SPEED SYSTEM acquires automatically diluted spectra of the heavy feed and determines the spectrum of the pure finished product. TOPNIR SPEED System addresses a number of various heavy feeds such as FCC, HCK, Coker Feeds, Atmospheric Residues, Vacuum Residues, Base Oils, Bitumen, Typical analyses on Heavy Feeds are Conradson Carbon, Viscosity, Aromatic Detailed Analysis, Distillation Curve, Basic Nitrogen, TAN, Sulphur, Density, Metals. On Bitumen, several properties are given such as Penetration, Softening Point, Aromatics.